LAS VEGAS, MARCH 15, 2017 – RTW, a leading vendor of visual audio meters and monitoring devices for professional broadcast, production, post production and quality control, is set to debut a 19-inch rackmount for its TM3 and TM3-Primus series of products at this year’s NAB show (Booth N7220). 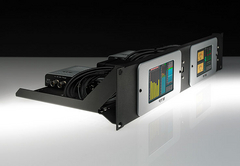 Also on display will be RTW’s well-known TM7/TM9 TouchMonitors with upgraded firmware. The TM3 RackMount Solution comes in two versions that integrate easily with either the TM3 TouchMonitor or the TM3-Primus TouchMonitor by simply swapping out the necessary hardware. The TM3-2U is a mounting system for RTW’s TM3 series products, including the TM3, TM3S, TM3-3G and TM3-3GS. With the appropriate mount, the TM3-Primus may also be used in this configuration. The TM3-Pri-2U is the exclusive rackmount for RTW’s TM3-Primus, allowing mounting for the TM3-Primus into an appropriate mechanical environment for a customer installation. Designed for workstations and edit suites, the compact TM3 TouchMonitors come with a highly intuitive and user-friendly 4.3-inch touchscreen interface that allows for vertical and horizontal operation with a full set of easy-to-read instruments for level and loudness metering that can be preset. The TM3-Primus is the world’s only USB audio monitor and features RCA-type two-channel analog and digital (SPDIF) loudness and level meters that meet worldwide standards. With its USB hybrid mode, operators can visualize and process DAW metering points directly on the screen. Also on display at NAB 2017 will be the latest firmware version for RTW’s TM7/TM9 TouchMonitors. This firmware offers up to four parallel instances of the stereo vectorscope, allowing simultaneous monitoring of transmission streams. A 12th octave filter bank has been added to the RTA (Real Time Analyzer) feature set for an even more refined graduated frequency distribution analysis. A custom selected password feature has also been implemented to meet the demands of users who desire increased security against unauthorized adjustment changes. Firmware version 6.0 also supports four-channel operation of a TouchMonitor, even without the presence of the multichannel license. This allows attractive combinations in operation with RTW’s TMR7. In addition to the new features, adjustments have been made to adhere to the recent changes in the loudness standards around the world. The new firmware can be installed into all RTW TM7 and TM9 series instruments, as well as into TMR7 units. TM7 and TM9 “TC Electronic” devices can also be updated to benefit from bug fixes. To access all new features and functions these devices must be upgraded with the SW20021 TC Conversion Kit. RTW will also be showing its well-known software and hardware products at its NAB booth. This includes the company’s Continuous Loudness Control (CLC), MasterClass plugins: Loudness Tools and Mastering Tools, SurroundControl 31900 and 31960 series, and its full range of TouchMonitors.